A benefit concert organised by a University of Northampton technician has raised more than £1,000 for a youth music project that bridges ethnic divides in Kosovo. 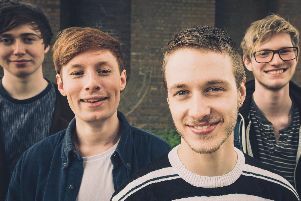 Tim Halliday, who works as a performance technician in the Faculty of Arts, Science and Technology, masterminded the fund-raiser, which saw much-fancied London lo-fi rockers Happyness headline – with support from Northampton’s OhBoy! and Brighton three-piece Broadbay. The event, at Northampton’s Picturedrome on Saturday raised £1,245 for Mitrovica Rock School. Set up by charity Musicians without Borders, the school provides a neutral platform for youth from both sides of ethnically divided Mitrovica to meet as young musicians and aspiring rock stars. Mitrovica is one of Europe’s most divided cities, where the conflict between Serb and Albanian communities still continues with barricaded bridges over the Ibar river, increased tensions and regular outbursts of violence. Tim became involved with the rock school after visiting Kosovo to document a University of Northampton initiative being run for young people there. “I was humbled and overwhelmed by the support for the fundraiser on Saturday,” said Tim. University graduate and OhBoy! guitarist Meg Amirghiasvand said: “We expected a fairly sizeable crowd due to the amount of hard work Tim put into organising and promoting the show, but couldn't believe how many people actually came. “The place was packed out and everyone was getting really into the music, which is pretty rare for a local gig.